Before Baylor’s latest massive athletics scandal, the university’s football team sucked on a different level: they couldn’t win games—at least until RGIII showed up and made them respectable. They couldn’t give tickets away when I went there, so they covered up the unused endzone seating with a giant tarp. 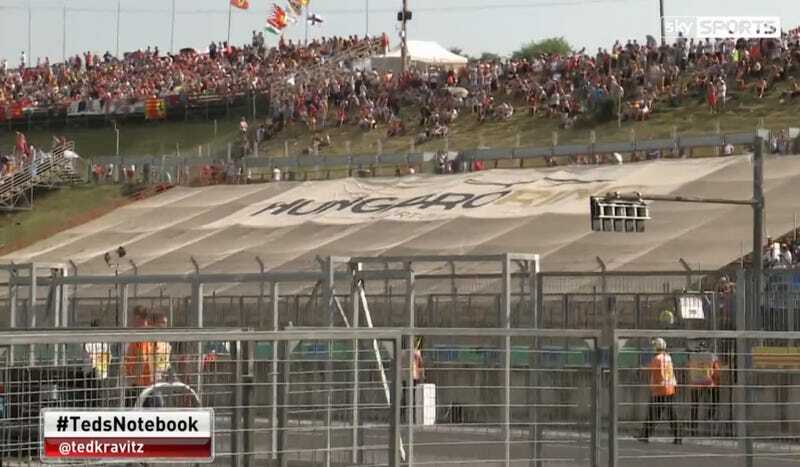 Uh, hey, guys—what’s that at the Hungaroring? I don’t know why they covered up those seats there. I’m not sure whether they’re some sort of China thing, where they had some seats and they haven’t sold them, so they covered it over with some sort of appetizing. But anyway, when I remember coming here in the nineties, it was, um—that was all seats there. There are fewer fans. China, of course, refers to the Shanghai Grand Prix, which has been also been known to cover grandstands with a tarp. To a tarp’s credit, empty seats look bad. However, it’s a big, flowing admission that you couldn’t move a chunk of permanently installed seats. Someone, somewhere has to see enough continued lack of demand to feel as if purchasing a large custom tarp is a good investment. Is this a distressing sign of the times for F1? Given that races all too often follow the same formula of “Mercedes claims pole, Mercedes wins, Mercedes drivers bicker with each other over something,” it all looks a bit too predictable to casual motorsport fans. Sure, I care about that eyebrow-raising move Max Verstappen did in front of Kimi Räikkonen, as well as the other interesting mid- and back-field battles. I want to see how the newer guys are doing to see who might be the next dominant force in F1. Many longtime fans do. But I’ve also adopted the same attitude towards F1 that World Rally Championship fans who are tired of seeing Sébastien Ogier win every rally have. Mercedes’ Nico Rosberg and Lewis Hamilton are going to duke it out for the win, but the guy who wins the other race between everybody else who’s not in a super-dominant car—that’s the real battle to pay attention to. There are more cars competing on that level. Maybe that doesn’t work to the average dude reading the same kinds of headlines week-in and week-out. After all, racing coverage tends to focus on the front-runners at the expense of including battles further down the field. Having two cars on the same team in a de facto class above everyone else isn’t a convincing way to get new fans to tune in. Predictability doesn’t sell seats. Knowing that you’re going to get annihilated by over thirty points on your home field sure didn’t, and apparently, neither does knowing that a Mercedes is going to win. I know this tarp, and this tarp is not a good sign.